Gears of Halo - Video game reviews, news and cosplay : What is the Halo Encyclopedia? Aren't encyclopedias extinct because they are redundant in the internet age? I'm mean you don't see any salesmen wandering streets trying to sign young mothers up to monthly subcriptions of Britannica's A-Z of the Universe any more do you? 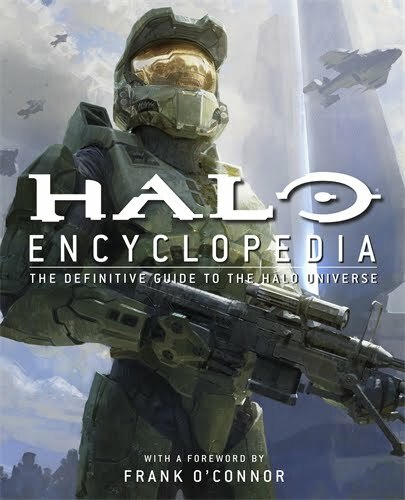 So what's with Microsoft releasing the Halo Encyclopedia ? Why do we need one of those? The official blurb is "Created in full collaboration with Microsoft, Halo Encyclopedia is packed with hundreds of images, illustrations, and technical drawings that highlight all the information fans and newcomers to the game need to know. Everything you ever wanted to know about Master Chief and the Halo Universe: origins of the game, the mechanics behind it, all the weapons, villains, heroes, locations. Includes behind the scenes information, history, and insider tips on the game." The book was witten by on Tobias Buckel, whom keen Halo fans might recognise as having been the authour of The Cole Protocol The encyclopedia (Man, that word is hard to write!) also has a forward written by Mr Halo, Frankie O'Connor. Okay I'm sold, where do I buy?